With three kids who are all seven and under and who all love to go outside and tumble around, throw themselves down hills, and also love to share their germs with each other (and us!) a well-stocked first aid kit is a necessity in our house. 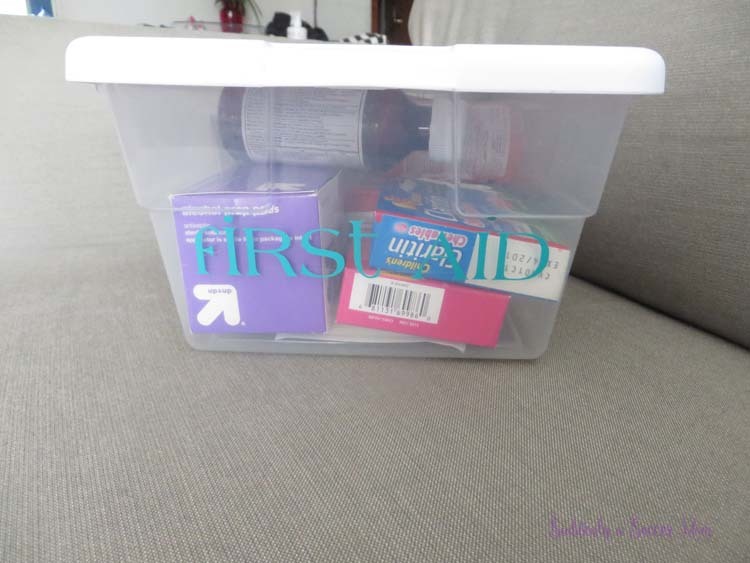 We also want to make sure our first aid kit is easily accessible and always has the products we need in it to make sure we can bandage up boo-boo's, combat allergies, and treat coughs and fevers right away. To start, I ordered these Sterilite Storage Boxes. I buy the 12-packs of these because I use them all over our house to keep small items together. I had an extra one lying around from organizing the vanities in both bathrooms, and figured it would be a perfect size. I used my Silhouette Cameo 2 and this teal indoor vinyl to make up a quick little label that simply says "First Aid". 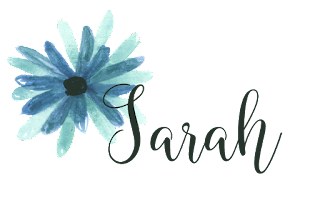 I really wish I could remember what font I used for these, because it's super cute! Unfortunately, this was one of those quick Silhouette projects that I typed out and then deleted, and with over 1,000 fonts on my computer, I may never find it again. Is anyone else a font addict? Please say I'm not the only one! This storage bin is the perfect size. It holds everything we need in it (and more! ), but is still small enough to be easy to grab and move around. 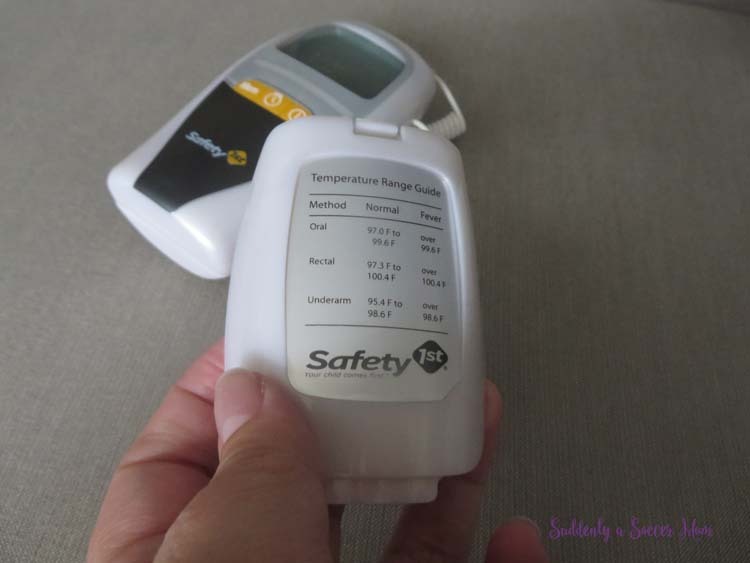 This family thermometer from Safety 1st is always front and center in our first aid kit. 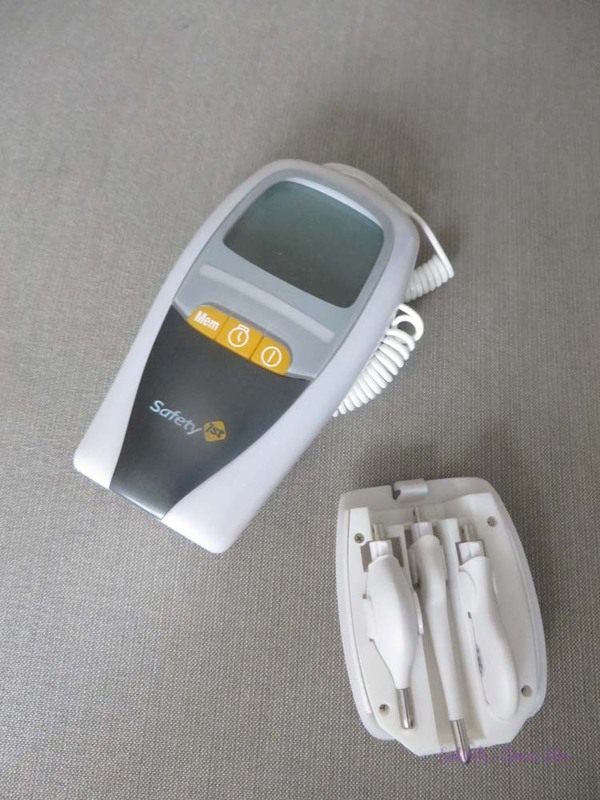 I love that it has multiple attachments for taking temperature orally, rectally (we're out of this stage thank goodness!) or in the underarm. It also has a little chart on the back of the attachment cover, which is nice for quick reference. If the thermometer detects a fever, it beeps and the little bar under the display screen will flash red. It also knows which attachment is plugged in, so you never have to worry about it giving a false fever reading. Medication-wise, we always have allergy medication (I received these Claritin products for free to try through BzzAgent) to help with the kids' seasonal allergies, cough medicine to help with the colds that seem to go through all three kids every two months or so, and some ibuprofen. We use the ibuprofen for fever control more than anything else - our kids seem to be especially susceptible to fevers! 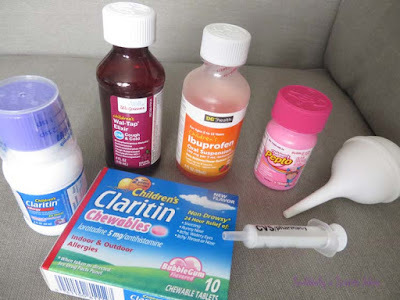 The children's Pepto tablets were a lifesaver a couple of months back when a stomach virus ravaged our house, and I will never again not have it stocked in our house. All three kids were vomiting like crazy, and the Pepto was magic! 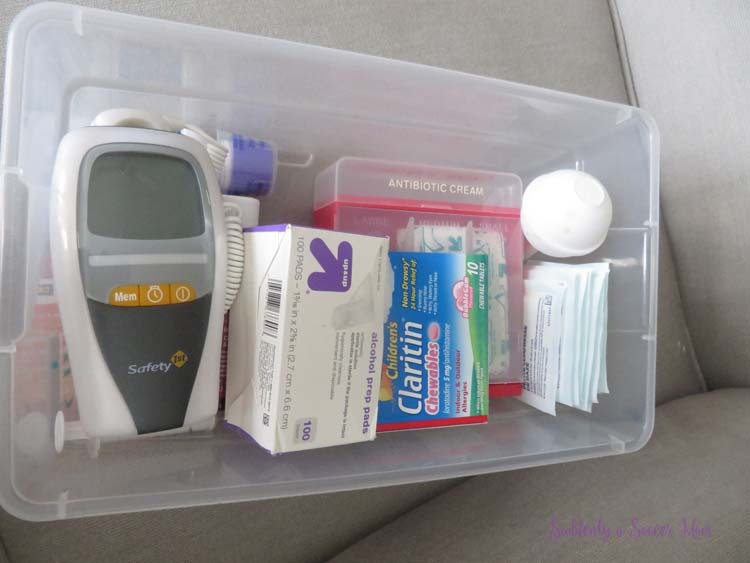 We also make sure to keep a nasal aspirator and a liquid medication syringe in the first aid kit for obvious reasons. We also have alcohol prep pads in our kit to make sure we can sanitize the thermometer and the liquid syringe after each use. We have this handy bandage box tossed in there as well, along with some larger gauze pads for "boo-boo sterilization" and bandaging up the larger wounds. 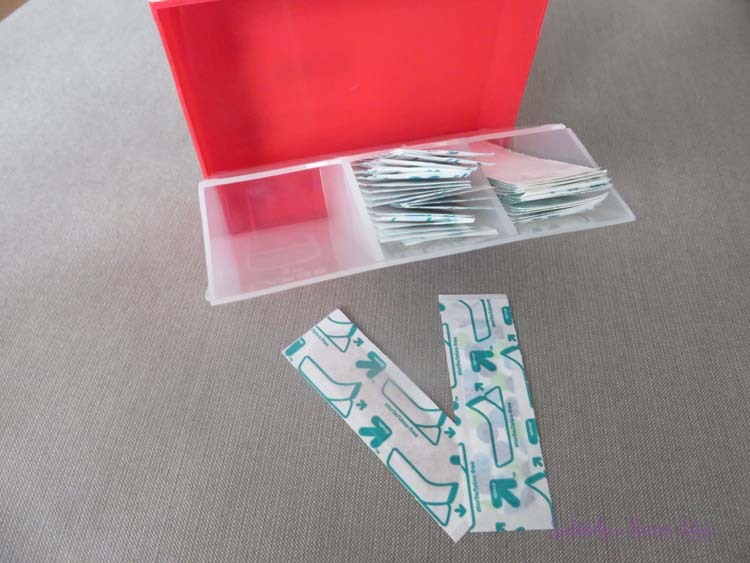 The bandage box flips out and has three compartments. They're labeled on the front as different sized bandages, but I have fabric bandages on one side and "plastic" printed bandages on the other. I try to keep them sorted because I'm actually allergic to adhesive. I can wear the plastic-type bandages for a short period of time, but wearing a fabric bandage for more than an hour leaves me with some awesome hives and an itchy rash. You're welcome for sharing. Everything fits all nice in the little bin! Let's just get real here for a second - it never looks like this. I organized it all nice after I took everything out to photograph it, but it never stays like this. But at least I know where everything is, even when it's messy. 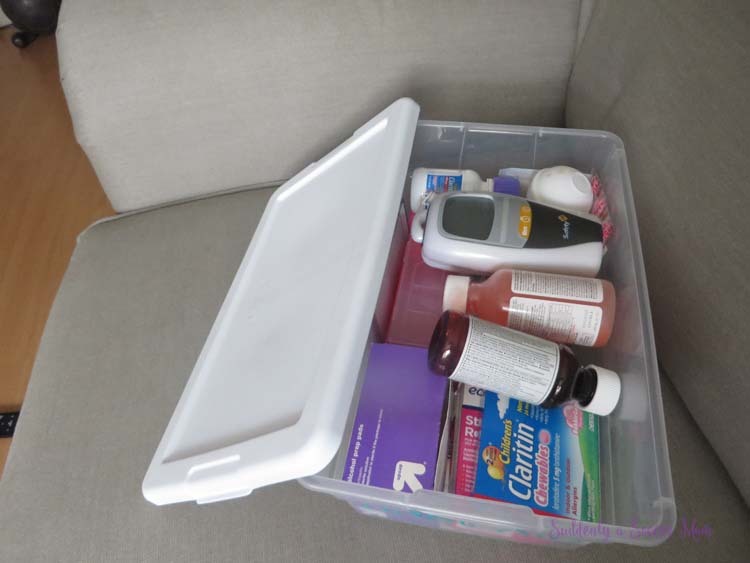 The two things I normally have in here that I'm now realizing are missing are some kind of antibiotic cream along with some medical tape. I'll have to find those and get them tossed back in here. Because excess moisture in the air, you're not supposed to store medication in the bathroom. In addition to this, with how small our bathroom is there's nowhere we can put in in there without the kids being able to reach it. 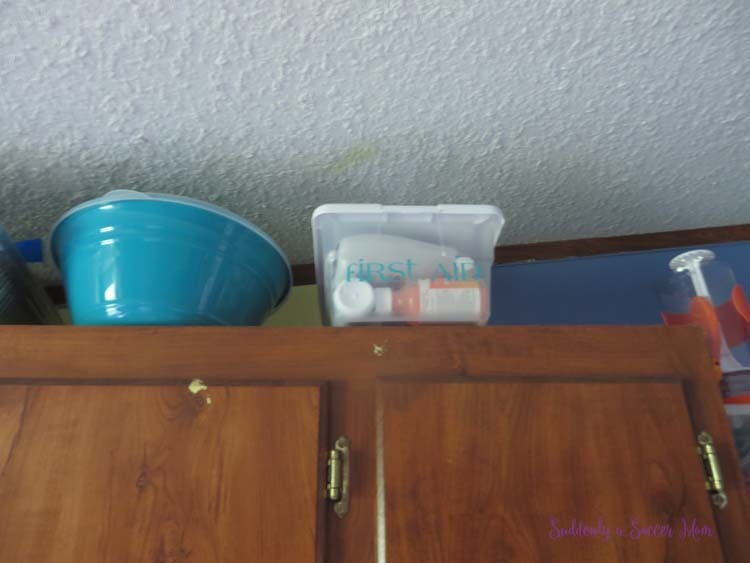 We're able to store our first aid kit above our kitchen cabinets, where it's well out of the reach of the kiddos. Our whole roof does a vaulting thing, so right about here the ceilings are just over 7' tall, so it's an easy reach for 6' Deputy Dad and 5'8" me to grab the box when we need to. Safety first! Do you have an easy access first aid kit? What do you have in it? Can y'all think of anything I'm missing in my kit? Let me know!! Good tips for what to include! The last time I checked mine a bunch of meds were expired, so it's definitely time to update!